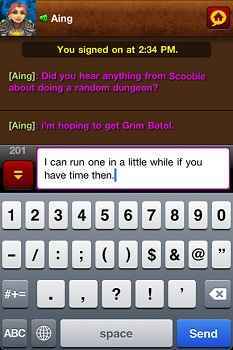 In today's Guild's Eye View, MMORPG.com columnist Sean Stalzer takes a look at remote guild chat in World of Warcraft. Sean's contention is that community is the lifeblood of any MMO and chat is an integral part of ensuring that a community feels connected. Check out Sean's thoughts about remote guild chat in WoW and then weigh in with your own thoughts. I will likely reassert this premise many times more in the future but... Successful communities are the lifeblood of a successful MMORPG. Game developers that invest in the right tools and development of a culture that fosters successful communities will have the successful MMORPGs of the future. One of the areas that more focus needs to be paid to is the "always on" aspect of gaming. By that I mean things such as being able to communicate with your guild or friends, at any time, from anywhere, whether you are in the game or not. Player expectations continue to expand. The innovative things of today are merely the starting point for player expectations in the future. The proliferation of 'smart' devices is changing the expectations of players to include the desire to communicate with their friends regardless of whether they are playing a game or not. You can text a friend, update your Facebook page and send an email from your smart device. Why can't you send a "tell" to your buddy within the game you both enjoy or why can't he alert you that they need you to login to support a raid? You can do that through interfaces and tools other than the game itself (i.e. call your friend or send a text to his phone) but seamlessly integrating that into the game itself is a growing expectation for an increasing section of the player base. While that expectation is not firmly entrenched in the culture yet, it is coming and the gaming companies that anticipate the need and meet it in the correct way will have a key differentiator in a crowded marketplace. All this leads me to share some thoughts about Blizzard's recent announcement of its Remote Guild Chat. The concept is great! I am glad to see a major MMO company finally putting the technology in place to make this happen. It speaks directly to the premise I outlined above. On your Android, or some iOS devices, you can read Guildsay and Officer’s chat as well as have a 1 on 1 conversation with a friend in tells. The interface looks clean and very similar to what you would see in game so the learning curve is low. So the concept is right on and having the technology going live in a major gaming environment will benefit the industry as a whole by fleshing out the bugs and hopefully leading to more games implementing similar apps/features. My core issue, however, is that the service is a "for pay" offering. While $2.99/month may not be much money to many players, I believe that these services should be free (much the same way I feel account security should be fully baked into all future games and be provided free to players. Having to pay for an authenticator to keep your game account secure after paying over $1000 in subscription fees so far is a complaint for another day) not because I necessarily object to the developer 'deserving' the money to cover the costs. Rather, I feel they should be free because I think both the developer and players will benefit more if they are. Having been involved with gaming for over 25 years I have seen countless instances where players continue to pay for accounts long after the game itself is boring simply because of the social aspects of the communities they are involved in. Said differently, anything a developer can do to engage its players more deeply in their communities will cause a significant percentage of them to pay for "one more month" before they close their account down. Everyone wins in that scenario. In the case of the Remote Guild Chat, if that were offered free to all players, I believe Blizzard would make more money from longer player subscriptions than they ever will from "leasing" its usage to a limited sub-set of players. The break-even point for the math is that in any given month you simply need 20% of the players that would have leased the application at $3/month to extend their WoW subscription (at $15/month) one extra month beyond when they would have closed it down. There are a huge number of players who would keep their account open for at least "one more month" if they had the ability to chat with their buddies who are still enjoying the game and thus still in game playing it regularly. 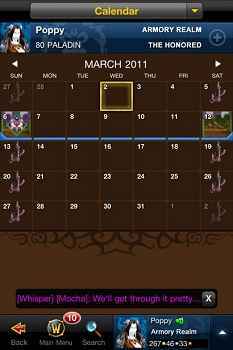 The connections players make with their friends are real and substantial and reinforcing those connections with an application like this will result in players staying longer. So from a purely economic standpoint, only 20% of the people willing to pay for the service would need to stay an extra month to break even with their current model in place today. If you then take into account that there is a large percentage of the player population who are unwilling to pay for the $2.99 service but some of whom will also keep an active monthly subscription longer if you give them the service for free then the cost/benefit equation shifts much more in favor of giving the application to players than charging them. Players benefit from making the tool free in two ways. The obvious way is that they get to use its functionality. The less obvious, but perhaps more beneficial way, is that a communications tool like this will extend the life of the game for many of your community’s other members. So, those players are not quitting and thus disappearing from your guild's social community. As more players quit the game, the social dynamics in a guild/community change or shrink. When that happens to a sufficient extent the guild may implode, close down or the subconscious pressure may increase to leave the guild in search of an experience like the one you remember having. By offering a tool like the Remote Guild Chat to all players, the social atmosphere of the community is preserved for longer. There is an additional hidden benefit for developers as well. 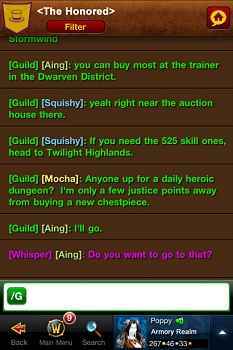 When a guild implodes, some of its members quit the game, thus costing the developer revenue. 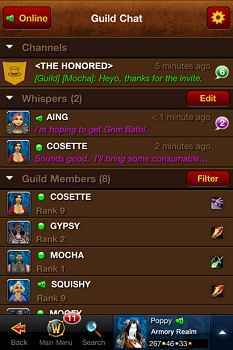 One (of many) reasons that guilds implode includes the breakdown of the social fabric of the guild. One of the contributing factors to that breakdown is the phenomenon of members who "take a break" from the game. They don't really want to take a break from their friends but they don't really want to login each night just to chat and the game itself is boring for them so they need a break from its mechanics. By providing them with an application they can load on their smart device, they can chat with their buddies in game as they watch TV or play other games. So, not only are they keeping their account open longer but they are aiding in the preservation of the social fabric of the guild and thus forestalling the implosion of the community and the loss of even more revenue to the developer. Blizzard (and other developers in the future) should be creating tools like Remote Guild Chat. Those should come standard with the game at launch. They should be free to all players. And in doing so, they will help transform the game from a limited experience into more of an "Always On" experience. That, in turn, will extend the life of the player’s subscriptions and those of their friends. Players in turn have a richer experience and form more and deeper friendships with the other members of their chosen communities. Charging players for the feature, like Blizzard is doing, is one way to go, but ultimately will make them less money and have a much smaller impact on the overall success of the community. I contend that they need to look past the initial greed of finding another way to make a few bucks and look at the longer term picture. Their game will benefit a great deal more by empowering everyone with the tool than relying on a small subset of players to buy it. As I asserted in my first piece, "By no means do I profess to have the "only" view on a topic and I would welcome debate, counter-ideas and differing viewpoints" What are your thoughts? Should features like this even be developed? If so, should they be micro-transactions or baked into the cost of the game itself? Is there more value in having them open to all than available only to those who wish to pay or who can afford to pay?